These advanced output passes allow 3d artists to make flexible adjustments to their images and animations during post processing and compositing. Spotmask is a lightning fast and easy to use solution for the requirements of serious image and video composition workflows. What are the Spotmask render elements? 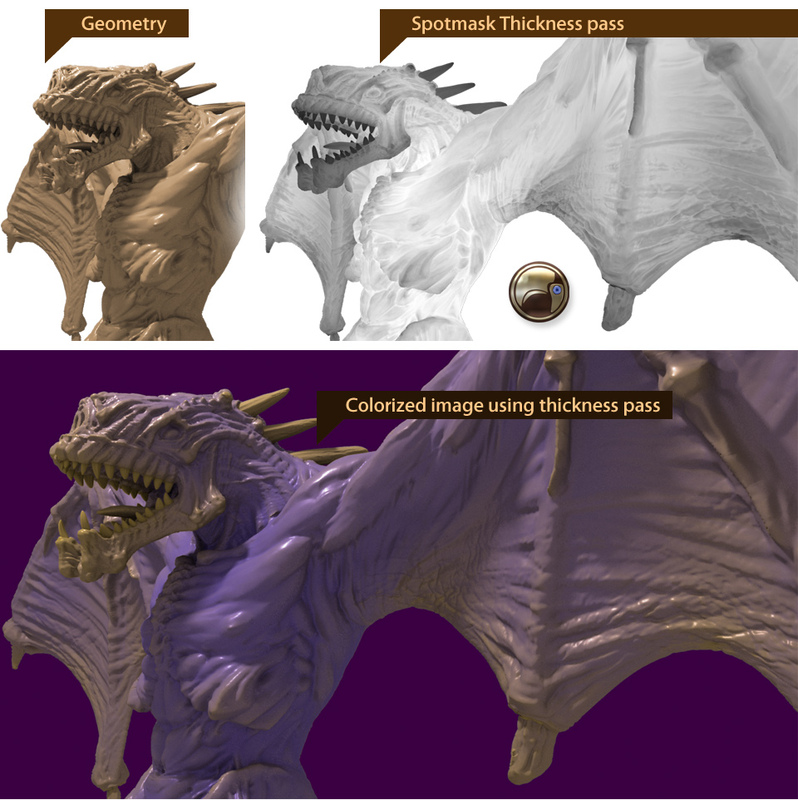 The Spotmask world position pass offers 3d artists the ability to better select and retouch any region of the image or animation sequence after it has been rendered. Unlike Z depth, the world position data saves location data independently of the camera view: even if the camera moves or the object is out of camera view it still remains masked. This way an artist can modify color, blur and visibility, or add any effect to selected areas of their rendered 3d environment. Did you ever want to change the textures in your scene after it has been rendered – without rendering it all again? UVW-Pass is your perfect solution: just add the Spotmask UVW-Pass render element to mental ray and it will give you the necessary mapping information. With this image information you can access and alter each texture of your image or animation. Motion blur is without a doubt one of the most time consuming components in animation rendering. While 3ds Max already offers 2 options to generate velocity data by default, Spotmask’s version offers a significant improvement for camera motion. The default velocity render element doesn’t generate view-dependent data and completely ignores camera movement. It only works for scenes with a static camera. The G-Buffer velocity channel does consider camera movements and creates view dependent data but the camera motion is considered incorrectly and the blur moves in wrong directions. This render element allows you to store the directions in which all surfaces are facing. This data can later be used to generate accurate reflections for light sources that were not there during the original render. Spotmask exports normal directions in raw and in clamped color space from mental ray world space, object space and camera space . 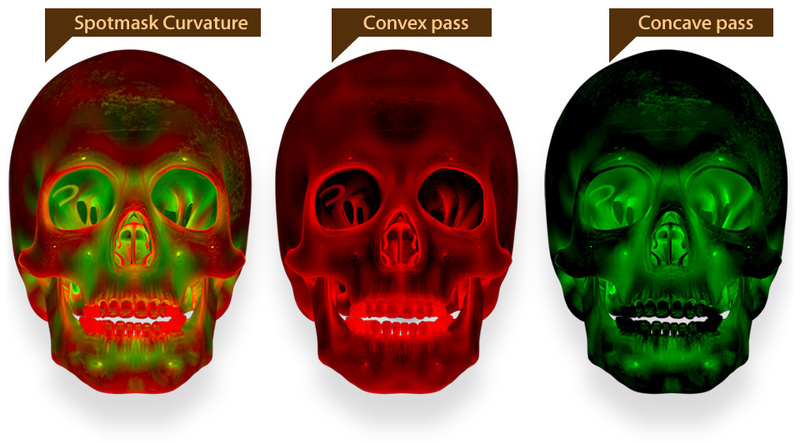 Spotmask implements a very precise and customizable curvature render pass. The Curvature render element determines how strongly the surface of objects bends in any given location. It also differentiates between convex and concave angles. This information can be used during post-processing to detect and modify grooves and ridges on objects. For example, artists can control two different topology properties in the final image: the geometry areas which are “bulged” (convex) or “inserted” (concave). It can enrich your final compositing with a beautiful AO-fake look or extra color details in creased mesh sections. This render element determines the volume thickness of objects over their surface. This information can later be used to add modifications like transparency or coloration to objects that considers their volume instead of being uniform. Speed, flexibility and access to advanced image post processing abilities. We all have customers who would like to change color, blur or any other effects – after the animations have been finished. And each of us know how much time and ressources it costs to render everything again due to a minor change in the scene. 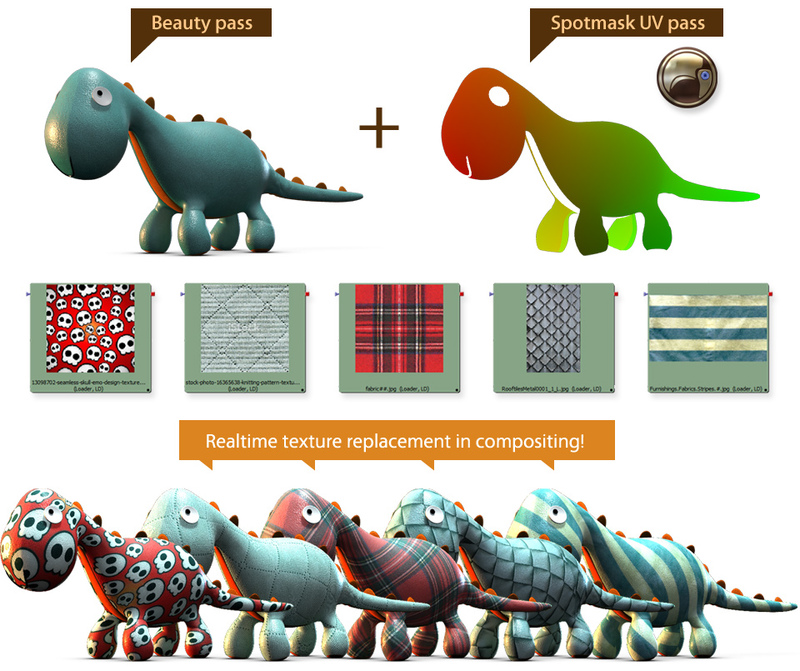 Advanced post processing methods that are facilitated by Spotmask allow you to perform these tasks efficiently in your favorite composting software (Fusion, Nuke, etc) without repeated time consuming render jobs. Animation artists, technical directors, film studios and everyone who renders time consuming animations that are subject to continuous changes. Furthermore, the usage of a velocity pass in compositing can create an approximated motion blur replacement that often looks almost as good as rendered motion blur – in a fraction of the required time. Spotmask was created for the 3ds Max mental ray renderer. It fully supports network rendering and distributed rendering. * Please consider that the correct Spotmask velocity pass works from Max 2014 and newer versions. The implementation of vector rendering in versions of 3ds Max prior to 2014 was wrong and did not render vectors for static geometries.